The forthcoming sequel to 1982’s classic film Bladerunner has its trailers out now on YouTube. For car builders, there have been a few tantalising glimpses of this film’s interpretation of the “Spinner”. It’s already inspired some Lego builders, including GoIPlaysWithLego, whose clean, sleek Spinner features at the top of this post. Calin has also produced a smooth Spinner and a classic version (below), which is well worth a closer look – click this link to his PhotoStream. What does all of this mean for the writers of TLCB? Firstly, we’re thinking of replacing our irritating Elven workforce with some obedient Replicants. Secondly, we get to indulge our growing penchant for sci-fi posts with tenuous British pop music links. Thirdly, we’re able continue our quest to try to understand sci-fi: do electric sheep dream of androids? Ridley Scott’s 1982 sci-fi epic Blade Runner is about to get an update. And it’s an update that looks – in the trailer at least – pretty awesome. Whilst we hesitantly but optimistically await the arrival of ‘Blade Runner 2049’, Flickr’s tfcrafter1 reminds us of one of the reasons why the original movie was so special. 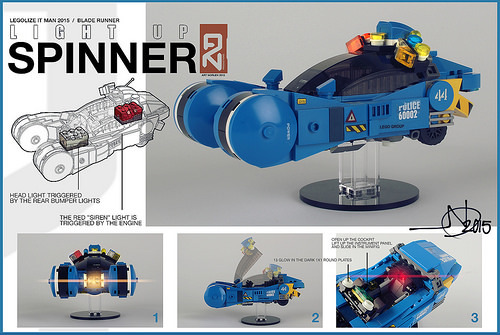 See more of his superb mini-figure piloted Spinner police hovercar at his photostream here. *Deckard didn’t have “notes” on his version of Flickr either. We’ve posted lots of Spinners from the cult movie Blade Runner here over the years, but this is the first one than lights up! It’s been built by Legolize It Man and you can see more on Flickr. TLCB’s favourite movie car maker is back, and with something a little special. It’s only 5 years until we reach the year when 1982’s Blade Runner is set, and we’re no nearer to hovering cars now than we were those 32 years ago, but they still look just as cool. 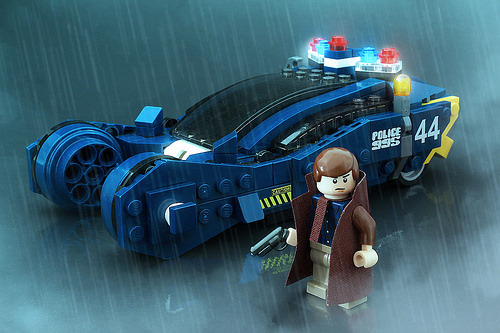 This is the Police Spinner from the legendary sci-fi film and it’s the work of Flickr’s and Brothers Bricks‘ Ralph Savelsberg. See more of this and his other movie cars here.